Box Text: A gory, disturbing and uncomfortably exhilarating tale of mystery, fear and survival, in the tradition of the greatest Japanese horror classics! 08-08-2018 tripredacus Box Text A gory, disturbing and uncomfortably exhilarating tale of mystery, fear and survival, in the tradition of the greatest Japanese horror classics! 10-24-2013 argyle Box Text A gory, disturbing and uncomfortably exhilarating tale of mystery, fear and survival, in the tradition of the greatest Japanese horror classics! Join eight students and one teacher as they inadvertently invoke a powerful curse and find themselves wandering the haunted halls of Heavenly Host -- a constantly shifting echo of a tragedy-stricken elementary school that should have been torn down decades ago. With vengeful spirits lurking around every corner and an omnipresent pressure in the air threatening to break what's left of their sanity, they must race against their own impending dooms to solve the mystery of where and when they are, cataloguing the rotting corpses of their own unsuccessful predecessors all the while. Featuring retro-styled 2D visuals, agonizingly detailed art stills, binaural 3D audio with original Japanese voices, over two dozen endings and some truly twisted depictions of death, this story-driven horror adventure is the perfect nightmare fuel. 01-08-2013 desocietas Box Text A gory, disturbing and uncomfortably exhilarating tale of mystery, fear and survival, in the tradition of the greatest Japanese horror classics! Join eight students and one teacher as they inadvertently invoke a powerful curse and find themselves wandering the haunted halls of Heavenly Host -- a constantly shifting echo of a tragedy-stricken elementary school that should have been torn down decades ago. With vengeful spirits lurking around every corner and an omnipresent pressure in the air threatening to break what's left of their sanity, they must race against their own impending dooms to solve the mystery of where and when they are, cataloguing the rotting corpses of their own unsuccessful predecessors all the while. Featuring retro-styled 2D visuals, agonizingly detailed art stills, binaural 3D audio with original Japanese voices, over two dozen endings and some truly twisted depictions of death, this story-driven horror adventure is the perfect nightmare fuel. 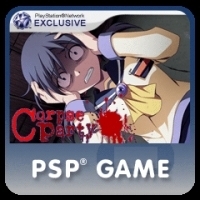 This is a list of VGCollect users who have Corpse Party in their Collection. This is a list of VGCollect users who have Corpse Party in their Sell List. This is a list of VGCollect users who have Corpse Party in their Wish List.